My college friend Brian and I went to the Minnesota vs. Notre Dame men’s hockey game. I was excited but a bit conflicted, since it was the first time I’ve seen both my alma maters play competitively. We had great seats behind the goal with the Notre Dame alumni club, so I dutifully donned my Irish gear complete with class ring, but also proudly wore my maroon Minnesota shirt. And, I cheered for everyone and jeered for no one. 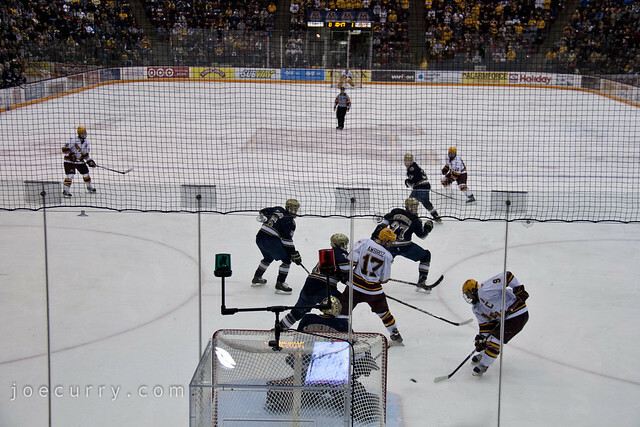 Today’s photo was literally milliseconds before Minnesota made a power play goal to tie the score at 1-1 .